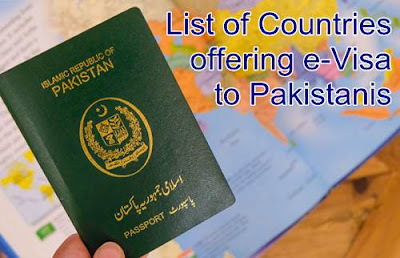 There are many countries offering e-Visa to Pakistani citizens which can be acquired online before travelling to that country. You can apply online for visa and pay via credit or debit card. You must meet certain prerequisites to qualify to get a visa for that country. Generally you must hold a valid Pakistani passport, return ticket and sufficient amount of money to cover your boarding, lodging, travel and food expenses during your stay in that country. Such type of visa is usually granted to persons who are visiting for travelling or business purpose. Major benefit of e-Visa facility is that the applicant don't need to visit an embassy of the country he wants instead he can apply for a visit visa online while sitting at his home or office. While in traditional way the applicant have to visit embassy of the country personally. There are 43 countries that don't ask visa from Pakistan Passport holders. e-Visa is a document which certifies that the holder is authorized to enter and stay in the country which issued it for a specified period. Applicants can obtain their visa electronically, after providing the required information and making the payment online. Once the application is approved, the eVisa is sent to the applicant by e-mail. Candidates are required to print their eVisa and keep it with their passport at all times when travelling. Here is a list of countries which offer e-Visa for Pakistani citizens. Pakistani tourists can obtain up to one month e-visa of Malaysia from official website of Immigration Department of Malaysia. You need following documents; scanned passport copy, return ticket in jpeg image format, hotel booking and bank statement in pdf format. If you hold a valid Pakistani passport, you are eligible to apply for Bahrain e-Visa online for Tourism, Business or Investment purpose. Turkey spread over parts of two continents; Asia and Europe. To apply for Turkey e-Visa, you must hold valid visa or valid residence permit from one of the Schengen Countries, USA, UK or Ireland. You have to prove that you hold a return ticket, hotel reservation and at least 50$ per day of your stay. This visa is valid for 180 days but stay cannot exceed 30 days. Pakistanis can also obtain Azerbaijan e-Visa for many type of visitors e.g. tourists, business, science, education, labour, culture, sports, humanitarian, medical treatment, personal or business trip. 23US$ visa and service fee for standard 3 day processing period and 50US$ fee for a 3 hours visa processing time. Pakistani tourists, businessmen, diplomats, investors and students can apply for Kyrgyzstan visa online. Pakistani passport holders can get Tajikistan e-Visa online by applying on official website. And to my surprise, there is no visa processing fee for Pakistani tourists, businessmen and students; so you can get free Tajikistan visa. Pakistani nationals can Sri lankan e-Visa for a fee of $35. Single entry e-Visa is valid for 90 days and fee is 52 US$. During the application process you will be required to attach copy of passport bio data page, photograph along with following documents mentioned against each type of visa. 1. Invitation Letters from family. 2. Identity card / Passport / Alien card / Entry permit of the host. 1. Travel itinerary (Details about places to visit if going as tourist). Fee for 28 days tourist visa is 50$ while it is 56$ for express service. You may apply for e-Visa of Zimbabwe online. This country comprises of two large and several small islands in Caribbean region of New Zealand. You can apply for Electronic Entry Visa (EEV) for travel to and entry into Antigua and Barbuda country. You should have an email address, valid passport, recent digital photograph, supporting documents and a credit card to pay for the visa. Cambodia is located in Southeast Asia. You can get Cambodia single entry tourist e-Visa for 30 days within 3 days for a fee of 36 US$. This e-Visa is valid for 3 months. Fee for 14 days transit visa is $12 while fee for 90 days short stay visa is $23. Fee for 70 days business visa is 70$. Approval process may take up to 3 days. For more detailed and up to date information, you should visit website of immigration department of the country you want to travel. Please avoid buying air tickets before confirmation and approval of e-Visa.